Booties are lightweight shoes for newborns and babies up to one year. Previously only lace crochet shoe-shaped socks were called baby booties. Currently, the concept of this piece of child’s wardrobe has become much broader and more fascinating. Why do newborns need baby booties? Infants are much more in need of heat as compared to other people, the reason is they just left their little best cubby: mummy’s womb. The most vulnerable to cold are the head, feet and hands of the baby. That is why it is so important to keep them warm and dry. To always have baby’s feet warm and cozy, buying booties for newborns ahead of time is essential. Booties are a great replacement of footwear for children who are yet to master walking and now are exploring the world sitting in a stroller when outdoor. New inexperienced mums struggle while puzzling out the diversity of children's things on the market today. Purchased goods happen to turn inconvenient and useless. To prevent the case this time you should understand the kinds and types of baby booties. Fur baby booties are a win-win option for a walk in off-season time. They are not heavy and designed to perfectly warm tot’s feet. 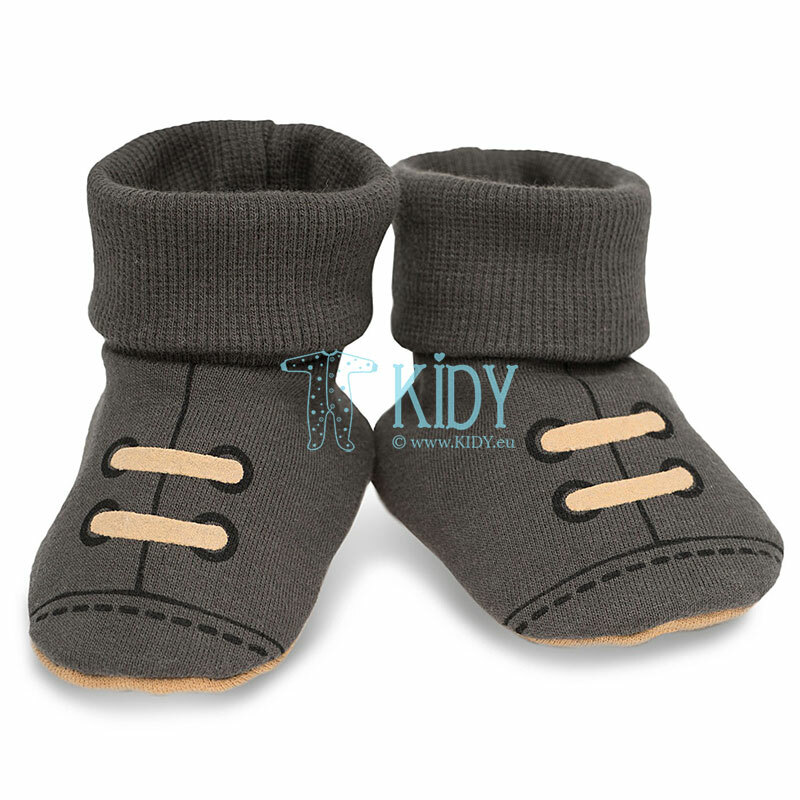 Leather booties are suitable both for infants and older babies. The benefit of these "shoes" is that they do not get wet. These booties come in handy when the kid wants to walk the paths in the park hand in hand with adults. Then you should wipe them clean with a wet tissue before putting your curious fidget again into the stroller. As compared to shoes leather models weigh less meaning your baby will feel more comfortable. Classic ones-knitted woolen laced socks. They are lightweight and warm, so they make an ideal choice for a just-born baby. Baby booties for boys traditionally are performed in blue, whereas for girls in pink. Crochet baby booties with colourful toe. A good option for trendsetter. It is impossible for anyone to resist such a beauty. Booties for newborn girls are often decorated with bows and lace that make crochet booties even more charming. Knitted sandals are made from cotton yarn and designed for hot weather. Such "shoes" will keep kid's feet warm; no sweating is possible as there are holes for ventilation. In addition, lace will save baby feet from direct sun rays falling in the stroller when outdoor. Shoes-like booties for little princesses have floral or lacy decorations, whereas boys option features more discreet decoration. Shoes-like booties feature dense sole and, thus, fit particularly kids, who are already trying to stand with support. 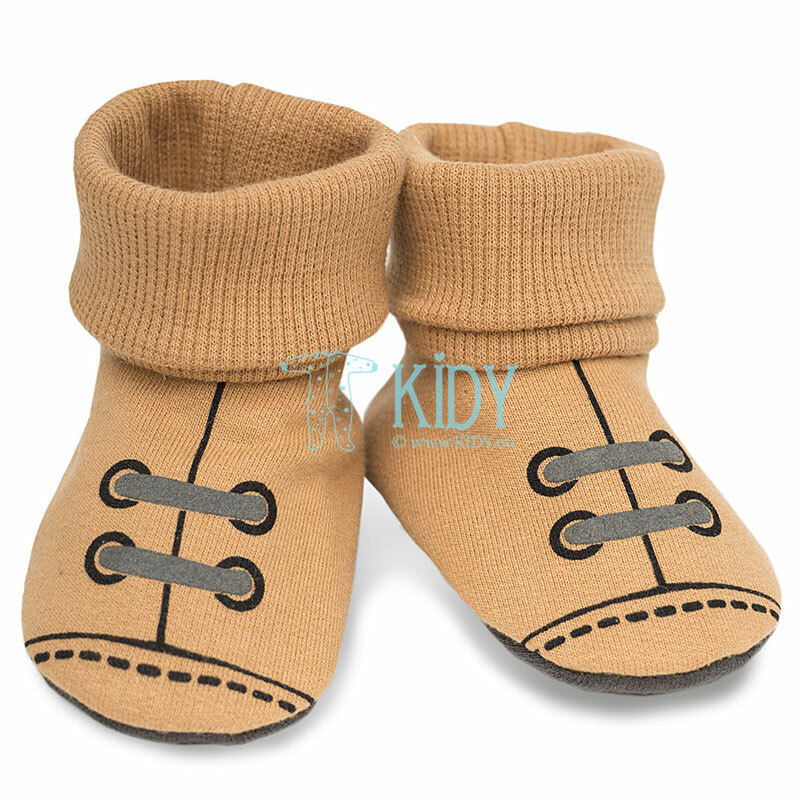 Canvas shoes booties for newborns are the most popular choice now. They look completely like the athletic shoes, have thick soles, so they are convenient for baby when he is standing. Leather tennies are excellent baby booties for spring. 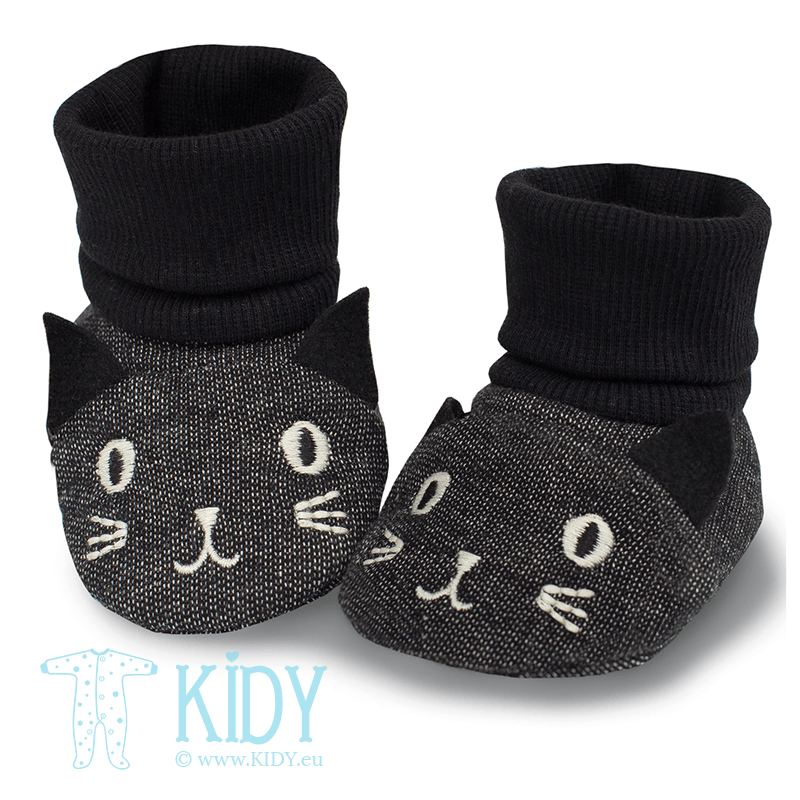 Boots-like booties are winter fur or fleece insulated booties for babies. Which model and fabric to choose? 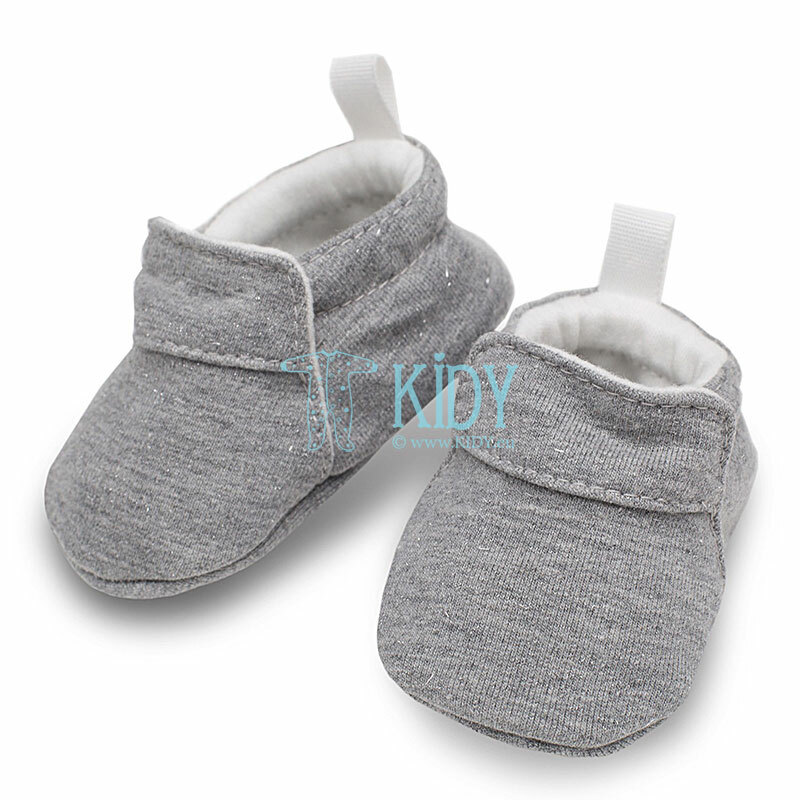 Newborn baby when indoor will enjoy comfortable cotton booties, whereas when outdoor wool or fur ones are proper option. A baby, who is just mastering walk with support, will love "socks" with rubber non-slip soles that make his feet confident when on the floor. 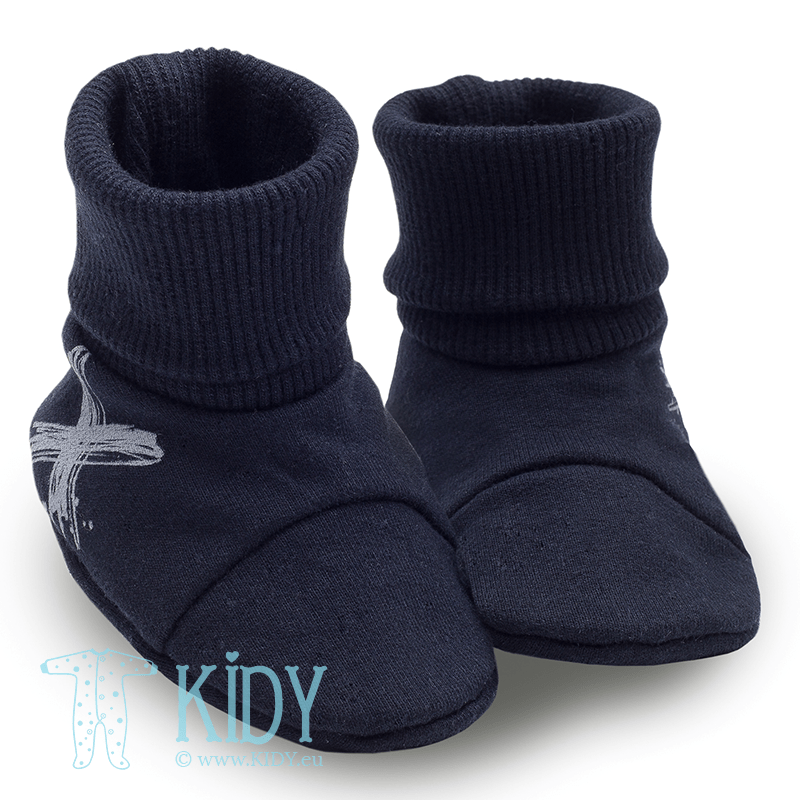 Therefore, you should always buy different kinds of booties depending on each stage of baby development. How to choose booties size? Choosing shoes for baby, a new mum should bear in mind that child's skin needs to breathe, so it is important to buy not only beautiful thing, but quality one: made of natural material. Warm woolen booties for newborns should not bite to save your baby from discomfort. Poorly treated cheap sheep wool often bites. Ankle elastic is not tight; it stretches easily. Booties size should be a few millimeters bigger than kid’s foot. If the baby has already arrived, then to measure the length of his foot and make a purchase keeping these data in mind is the best option. If you are looking for beautiful and quality booties, then pay attention to the products of our online store. Pinokio (Poland) - stylish baby clothes kits, embodying brand designers’ unique, creative ideas. Each new collection is not like the previous one. 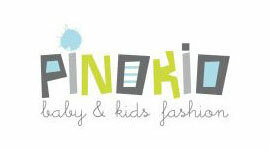 With Pinokio your baby will be the most fashionable in the vicinity. But the most important thing is that he will feel comfortable, because Polish brand stands out for excellent quality clothing. SMART FOX cute cotton booties will be the perfect complement to a naughty image, whereas stylish XAVIER booties in sober colours will complete a little trendsetter kit. Lorita (Lithuania) is the company that creates secure, high-quality, and beautiful clothes for newborns. The brand produces cotton, merino wool, bamboo, and linen clothing. All clothing is done in pastel colours. Brand assortment also includes baby booties-merino wool ugg boots that retain heat and give soft touch to those little feet. There are constant promotions and rebates in our store. Fast shipping and available payment methods will help to purchase easily. 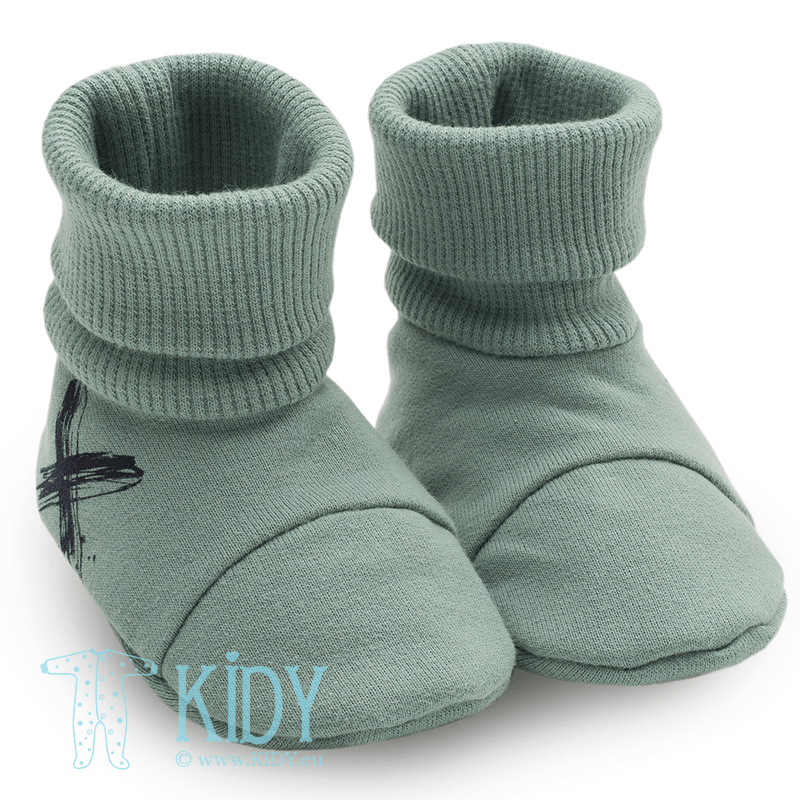 Your baby deserves only the best, hence you are welcome to buy him high quality, soft, and stylish booties in Kidy.eu.